Geoenvironmental Engineering in a Global Environment. Introduction. Scope of Environmental Problems. Pollution of oceans and international rivers. Water scarcity and degradation. Global population. Control of chemicals. Trans-boundary movement of hazardous wastes. Acid rain. Deforestation. Desertification and soil erosion. Global warming. Depletion of the ozone layer. Decreasing species of wildlife. Environmental pollution in developing countries. Interconnection of Global Environmental Problems. 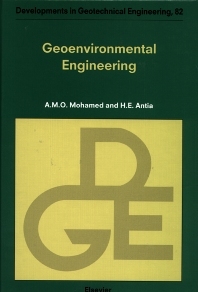 Geoenvironmental Engineering Aspects. Actions Towards Restoring the Environment. Comprehensive policy response. Environmental policy. Environmental ethics. Summary and Concluding Remarks. Sustainable Development. Introduction. Approaches to Sustainable Development. Economics and sustainability. Environmental sustainability. Social sustainability. Land sustainability. Sustainable Development and the Ambient Environment. Assimilative capacity in environment management. Water quality management and sustainable development. Environmental Impact Assesment. Guiding principles. Attributes of a successful EIA. Evaluative tools. Engineering for Sustainable Development. Summary and Concluding Remarks. Sources, Characters, and Management of Wastes. Introduction. Sources of Wastes. Municipal solid waste. Pesticide wastes. Mining wastes. Electroplating and metal finishing industry. Metal smelting and refining industries. Pulp and paper wastes. Petroleum refining wastes. Paint and allied industries. Hazardous Waste. Unites States of America. Canada. European Community. Germany. The Netherlands. Hazardous Waste Management. US regulation disposal philosophy. Canada. European Community. Summary and Concluding Remarks. Soil System. Introduction. Soil Phases. Gas phase. Fluid phase. Solid phase. Mineral Composition. Primary and secondary minerals. Trace elements in soil minerals. Mineral Transformations. Crystal Chemistry of Silicates. Structural Components of Soil Clays. Silica, gibbsite and brucite sheets. Properties of Layer Silicates. Koalins. Hydrous mica (illite). Montmorillonite. Vermiculites. Chlorites. Sepiolite and palygorskite. Mixed-layer clays. Soil clays. Soil Organic Matter, Charge Development in Soils. Constant surface charge minerals. Constant surface potential minerals. Surface Functional Groups. Summary and Concluding Remarks. Soil-Water-Pollutant Interaction. Introduction. Adsorption Mechanisms. Adsorption Measurements. Metal Cation Adsorption. Metal cation adsorption by soil. Metal cation adsorption by soil constituents.Adsorption Equilibrium. Molecular Adsorption Models. Electric double layer structure. Gouy-Chapman model. Stern model. Other models. Organic Pollutant-Soil Organic Matter Interaction. Soil Organic Matter-Soil Minerals Interaction. Influence of Pollutants on Soil Hydraulic Conductivity. Influence of inorganic chemicals. Influence of organic chemicals. Summary and Concluding Remarks. Fate and Effects of Pollutants. Introduction. Pollutant Pathways. Environmental Fate. Surface water compartment. Soil compartment. Sediment compartment. Bioavailability. Availability of heavy metals. Availability of inorganic phosphates. Availability of organic chemicals. Effects of Pollutants. Uptake of pollutants. Types of pollutant effects. Parameter Identification. Physio-chemical parameters. Fate parameters. Effect parameters. Biological parameters. Tiered Test Program. Summary and Concluding Remarks. Site Investigation. Introduction. Site Investigation Approach. Phase Investigations. Collecting information. Field reconnaissance. Development of a conceptual model. Establishing the work plan. Phase II Investigations. Geophysical Techniques. Ground penetration radar. Electromagnetic. Surface resistivity. Seismic surveys. Borehole logging. Video cameras. Hydrogeological Investigations. Drilling methods. Sampling methods. Well installation techniques. Monitoring well design components. Well decontamination preocedures. Hydrogeochemical Investigation. Subsurface environment. Sampling considerations. Geochemical Data Collection. Sources of errors. Sampling methods and types. Geochemical Data Analysis. Summary and Concluding Remarks. Geostatistics. Introduction. Data Analysis Concepts. Histogram. Ogive. Summary statistics. Normal distribution. Semivariogram. Intrinsic Modelling. Structural Analysis. Stationary models. Nonstationary models. Model superposition. Kriging. Solution Methodology. Application. Summary and Concluding Remarks. Subsurface Pollutant Transport. Introduction. Modelling Process. Transport Processes in Soils. Advection. Diffusion. Dispersion. Transport Equation. Solute Transport Models. Conservative tracer. Reactive chemical species. Spill of pollutants. Pollutant plume. Methods for Calculating Transport Parameters. Laboratory methods for hydraulic conductivity testing. Laboratory methods for adsorption characteristics. Estimation of transport parameters. Summary and Concluding Remarks. Risk Assessment. Introduction. Basic Elements of Human Health Risk Assessment. Hazard Identification. Exposure Assessment. Toxicity Assessment. Introduction. Sources of toxicity information. Toxicological parameters. Exposure route considerations. Risk Characterization. Calculation of carcinogenic risks. Calculation of noncarcinogenic hazards. Summary and Concluding Remarks. Risk Management. Introduction. Elements of a Risk Management Program. Hazards identification program. Consequence analysis. Risk mitigation. Quantified Risk Assessment. Role Regulatory Agencies. Regulatory Approaches. Risk-based mitigation criteria. Numerically-based mitigation criteria. Mitigation Technologies for Polluted Soils. Natural attenuation. Containment. Removal and treatment. In-Situ treatment. Selection of Mitigation Options. Summary and Concluding Remarks. Surface Control Systems -Groundwater Extraction-. Introduction. Well Hydraulics. Steady state equations. Unsteady state equations. Capture zone analysis and optimization modelling. Goundwater Management by Hydrodynamic Controls. Extraction systems. Injection systems. Hydraulic Barrier Systems. Barriers using extraction systems. Barriers using injection system. Barriers using both extraction and injection systems. Design and Construction Sonsiderations. Site characterization. Assessment of property contraints. Remedial system design. Monitoring of system performance. Establishment of cleanup goals. Critical Evaluation of Groundwater Management. Tailing and rebound impacts on remediation. Contributing factors to trailing and rebound. Summary and Concluding Remarks. Subsurface Control Systems -Alternatives to Groundwater Extraction-. Introduction. Slurry Walls. Structure formation. Factors affecting structure formation. Influence of pollutants on slurry wall hydraulic conductivity. Slurry trenching quality control parameters. Grouting. Types of Grouts. Compatibility of Chemical Grouts with Pollutants. Grouting methods. Sheet Piling. Ground Freezing. Electrokinetics. Electroosmosis. Electrophoresis. Electrolysis. Reactive Barriers. In-Situ reactive zones. Types of reactive media. Engineering aspects of reactive barrier system. Summary and Concluding Remarks. Covering Systems. Introduction. Functions of Covering Systems. Soil-Based Covering Systems. Top Layer. Physical parameters. Environmental parameters. Chemical parameters. Drainage Layer. Infiltration Barrier Layer. Physical parameters. Chemical parameters. Biotic Barriers. Mining Waste Covering Systems. Dry barrier concept. Water barrier concept. Organic barrier concept. Types of Covering Materials. Natural materials. Modified soils. Synthetic materials. Waste materials. Summary and Concluding Remarks. Lining Systems. Introduction. Classification of Lining Systems. Clay Liners. Desirable Properties of Clay Liners. Low hydraulic conductivity. High attenuation of chemicals. Low diffusivity. Ductility. Slope stability. Adequate interface strength. Long term stability. Constructability. Required Properties of Clay Liners. Factors Controlling Properties of Clay Liners. Compositional Factors. Environmental Factors. Post Contruction. Changes. Physical processes. Chemical processes. Biological processes. Other Types of Lining Systems. Soil cement. Soil carbonates. Soil amorphous. Soil sealants. Flexible membrane liners. Summary and Concluding Remarks. Soil Vapour Extraction. Introduction. Technology Description. Site Conditions. Volitile organic pollutant distribution. Groundwater table. Infiltration. Location of heterogeneity. Temperature. Atmospheric pressure. Soil Properties. Soil hydraulic conductivity. Soil organic matter content. Chemical Properties. Henry's constant and solubility. Adsorption equilibria and the octanol-water partition coefficient. Diffusivity. Density and viscosity. Control Variables. Air withdrawel rate. Well configuration. Well spacing and surface covering. Pumping duration. Inlet air concentration and moisture content. Response Variables. Soil-related variables. Extracted air-related variables. System-related variables. Modelling of Vapour Removal Rate. Case Study. Temperature. Air flow rate. Organic carbon fraction. Soil moisture content. Issues Related to SVE Application. Feasibility study. Physical testing. Final system design. Monitoring. Integrated Systems. Air sparging. Bioventing. Thermal enhancements. Summary and Concluding Remarks. Solvent Extraction Processes. Introduction. Process Desription. Extraction Technologies. Metal mining. Metals mining methods versus hazardous waste treatment techniques. Selective Sequential Extraction. Description of the technique. Retention phases. Mobility and bioavailability. Extraction via Hydrochloric Acid. Extraction via Chelating Agents. Concept and definitions. Classification and properties of chelating agents. EDTA stability complexes in solution. Remediation via chelating agents. Extraction via Organic Acids. Summary and Concluding Remarks. Surfactant Extraxtion Processes. Introduction. Surfactant Properties. Definition and types. Surface tension. Critical micelle concentration. Solubilization and detergency. Dispersion. Micelle formation. ORganic pollutant properties. Solubility. Hydrolysis. Vapour pressure. Chemical alternatives. Soil System Properties. Activity. Porosity. Moisure content. Soil organic matter content. Buoyancy forces. Hydraulic conductivity. Interaction Mechanisms of Various Components. Soil-organic pollutant interaction. Pollutant-surfactant interaction. Soil-surfactant interaction. Micelle Formation in Surfactant Solutions. Micelle Solubilization. Surfactant Flow in Polluted Soil. Summary and Concludinf Remarks. Electrochemical Remediation. Introduction. Conduction of Electricity. Ohm's law. Mobilities. Electrochemical Reactions. Electrolysis. Electrode potential. Thermodynamics of electrode potential. Electrochemical reaction process. Transport of Electroactive Species. Migration. Diffusion. Convection. Electrokinetic Phenomena. Electroosmosis. Streaming potential. Sedimentation potential. Electrophoresis. Electrokinetic Remediation. pH variation. Redox potential. Surface charge of clay minerals. Soil buffering capacity. Control of pH and redox potential. Electrodialysis Remediation. Electrodialysis. Treatment efficiency. Summary and Concluding Remarks. Solidification/Stabilization Processes. INtroduction. S/S Processes. Inorganic-based processes. Organic-based processes. Cement Types and Composition. Cement Hydration. Kinetics of cement hydration. Hydration of phases in Portland cement. Factors Influencing the Set of Portland Cement. Accelerating Admixtures. Retarding Admixtures. Soil-Portland Cement Interaction. Soil-Lime Interaction. Hydration. Ion exchange and flocculation. Pozzolanic reaction. Carbonation. Controlling Factors in Soil Stabilization. Soil-Portland cement stabilization. Soil-lime stabilization. Kinetics of Reactants and Products in Stabilized Soil. Clay minerals. Cementing agents (CSH and CAH). Ettringite. Inorganic Waste-Portland Cement Interaction. Cations. Anions. Organic Waste-Portland Cement Interaction. Evaluation of Potential Leachability. Leaching Tests. Leaching Mechanisms. Leachate transport modelling. Factors affecting leachability. Summary and Concluding Remarks. Bioremediation. Introduction. Soil Biomass. Definition. Bacteria. Fungi. Microbial Metabolism and Growth. Microbial metabolism. Microbial growth. Microbial Reactions. Biomass growth. Aerobic respiration. Anaerobic metabolism. Microbial Transformation of Inorganic Compounds. Nitrogen transformation. Phosphorus transformations. Metal transformations. Microbial Transformation of Organic Compounds. Biodegradation. Cometabolic transformation. Polymerization. Microbial accumulation. Nonenzymatic transformation. Biotransformation Reactions. Hydrolysis. Oxidation. Reduction. FActors Affecting Microbial Transformation. Chemical factors. Environmental factors. Kinetics of Microbial Transformation. Summary and Concluding Remarks. Case Study. History of the Hypothetical Site. Water Quality. Sediment Quality. Development of Cleanup Alternatives. Comparative Analysis of Cleanup Alternatives. Permanent environmental criteria. Temporary environmental criteria. Technical criteria. Technical and economic criteria. Economic criteria. Non-discriminatory criteria. Non-pertinent criteria. Importance of rating. Remedial alternative selection. Summary and Concluding Remarks. Glossary. References and Suggested Reading. Index. The new social and economic era calls for integration of ecology and economy in a system of cause and effect. The central element in this shift is sustainable development. Fundamental to the achievement of sustainable development is the requirement for environmentally responsible waste management and restoration of the environment. Solutions to the complex problems confronted by waste management and environmental restoration industry are currently handled by the geoenvironmental engineering profession that needs a good background in soil biology, chemistry, mechanics, mineralogy, and physics. In recognition of this need, this book summarizes relevant aspects of various soil physics, mineralogy, and chemistry as well as the chemistry of pollutants. This treatment will provide sufficient background to students and practicing engineers to enable them to think about how to approach waste management and environmental restoration problems.